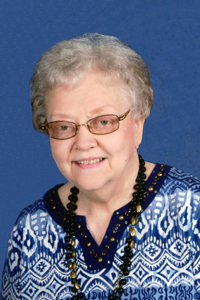 Dorothy Jean Midland passed away on March 24, 2019, at the Paula J. Baber Hospice Home in Fort Dodge. She was surrounded by many beloved family members as a courageous 3-year battle with Lymphoma and an auto-immune blood disease came to an end. Funeral services will be held on Friday, March 29, 2019 at 10:30 a.m. at Trinity Lutheran Church in Webster City. Burial will follow the services at Graceland Cemetery. Visitation will be held at Foster Funeral and Cremation Center on Thursday, March 28, 2019 from 5:00 p.m. to 7:00 p.m.
Dorothy Jean Opheim was born on January 29, 1938 to William (Willie) and Rachel Opheim on the family farm east of Thor. She grew up on the farm and attended Ullensvang Lutheran Church in Thor. She attended elementary school in Thor and graduated from Eagle Grove High School in 1956. After graduation, she attended Eagle Grove Junior College and worked as a secretary at the Eagle Grove High School. On August 9, 1959, she married Marvin Lee Midland of Eagle Grove. They moved to Ames, where Marvin attended Iowa State University. She worked as a secretary at the College of Engineering for 2 years. The family moved to Webster City in 1961 after Marvin graduated from Iowa State University. He began teaching at the Webster City Junior High. She was a dedicated homemaker and mom. In 1974, she began working in the office at McMurray Hatchery in Webster City on a seasonal basis. She worked there until her retirement in 2004. Dorothy was interested in many things. Marvin and Dorothy opened their home to many foster children over the years. She had been very active with church activities and circle at Trinity Lutheran Church in Webster City where she was a member since 1961. She was an excellent cook and enjoyed baking, especially bread and cinnamon rolls. She enjoyed reading, traveling, meeting with her red-hat group and having lunch with friends from McMurray Hatchery. She especially loved visiting with family and friends and was always interested in how everyone was doing. She is survived by husband Marvin of Webster City; children, Richard Midland of Mukilteo, WA, David Midland of Council Bluffs (Jean Midland of Dakota Dunes, SD), Gary (Kim) Midland of Faribault, MN; grandchildren, Joshua Midland of Dakota Dunes, SD, Connor and Collin Midland of Faribault, MN; foster daughter, Linda Downs of Fort Dodge and Alexandria Downs and Ali’s daughter Persephone (Perci) of Fort Dodge; siblings, Carolyn Kallem of Iowa Falls, Arlene Opheim of Fort Dodge, James Opheim of rural Eagle Grove, John (Diane) Opheim of Humboldt, and many nieces, nephews, great-nieces, great nephews and cousins. The family is very grateful to all the Doctors, nurses and staff at McFarland Clinic in Webster City and Ames, Van Diest Medical Center, Mary Greeley Medical Center and the Bliss Cancer Center in Ames and the Paula J. Baber Hospice Home in Fort Dodge. In lieu of flowers, memorials will be given to Trinity Lutheran Church. Online condolences may be expressed at www.fosterfuneralandcremation.com.